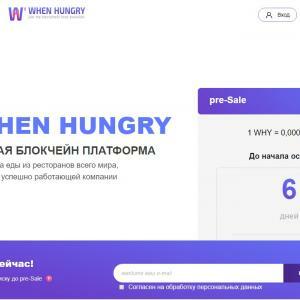 When Hungry is a global platform for ordering and delivering food, which combines the best restaurants in every city and in every country of operation. The platform, which unites the websites and mobile solutions, is implemented on the basis of the Internet and blockchain technologies. When Hungry is not a start-up, it's an existing project that successfully works in different markets in different conditions in 100+ large cities in several countries of the world, and is completely ready for further equally rapid scaling. The project is supported by heads of agricultural structures, medical institutions, and universities. The platform will help to track the quality of food products that are delivered in restaurants and, accordingly, the quality of the finished food that customers order. Ordering ready meals delivered to your home and office in a number of countries have become the norm, however, there are fundamental concepts pointing to new opportunities, new solutions, and technologies. Market readiness and lack of players;Unorganized market;Lack of transparency between market participants;Security payments;Lack of analytics of the received data;The incomprehensible formation of the rating of market participants.When Hungry solves the problems identified with the use of modern technologies and offers high-performance standards and full customer focus when the aggregator associated with the site, which has gathered the best in any understanding. At the same time, the platform itself has the interface that is really convenient for them and not the one that is convenient for restaurants or owners of aggregators or just like designers and programmers.